Scott Kelly returns from a year in space, a new U.S. astronaut takes his place, a colorful sun and more space highlights from March 2016. 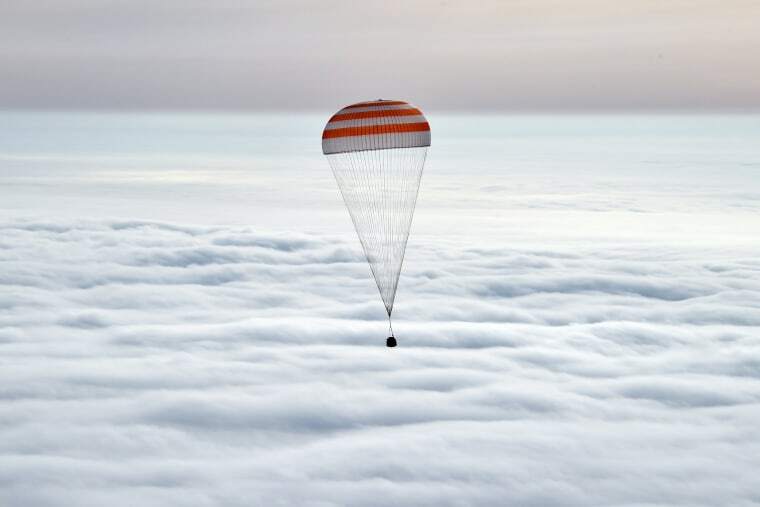 U.S. astronaut Scott Kelly and Russian cosmonaut Mikhail Kornienko return to Earth in Russia’s Soyuz TMA-18M space capsule on March 2, 2016. The pair spent almost a year in space in a ground-breaking experiment foreshadowing a potential manned mission to Mars. 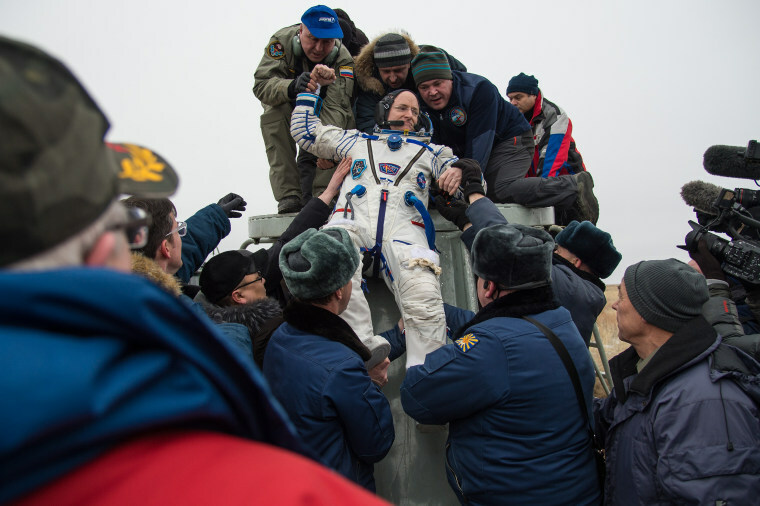 Scott Kelly of NASA is helped out of the Soyuz TMA-18M spacecraft just minutes after he and Russian cosmonauts Mikhail Kornienko and Sergey Volkov of Roscosmos landed in a remote area near the town of Zhezkazgan, Kazakhstan on March 2. Kelly and Kornienko's year-long mission provided valuable data on the effect of long duration weightlessness on the human body that will be used to formulate a human mission to Mars. Volkov returned after spending six months on the station. 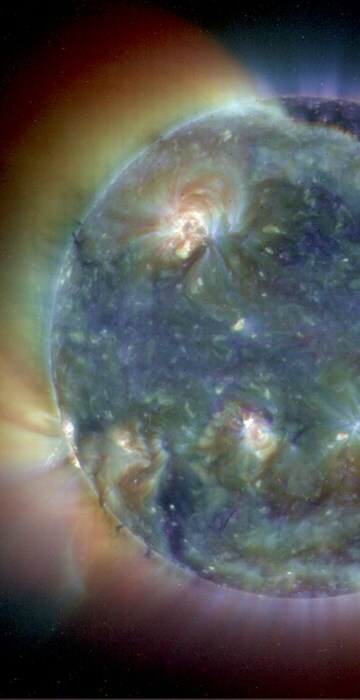 An ultraviolet image released on March 21 shows the sun’s intricate atmosphere. The sun is a prodigious nuclear reactor that sits at the heart of our planetary system and supplies our world with all the light and heat needed for us to exist. To the human eye, the sun is a burning light in the sky to bright to look at, but through the electronic eyes of the Solar and Heliospheric Observatory (SOHO), we can appreciate delicate beauty and detail of it's atmospher. SOHO’s extreme-ultraviolet telescope was used to take these images. This telescope is sensitive to four wavelengths of extreme-ultraviolet light, and the three shortest were used to build this image. 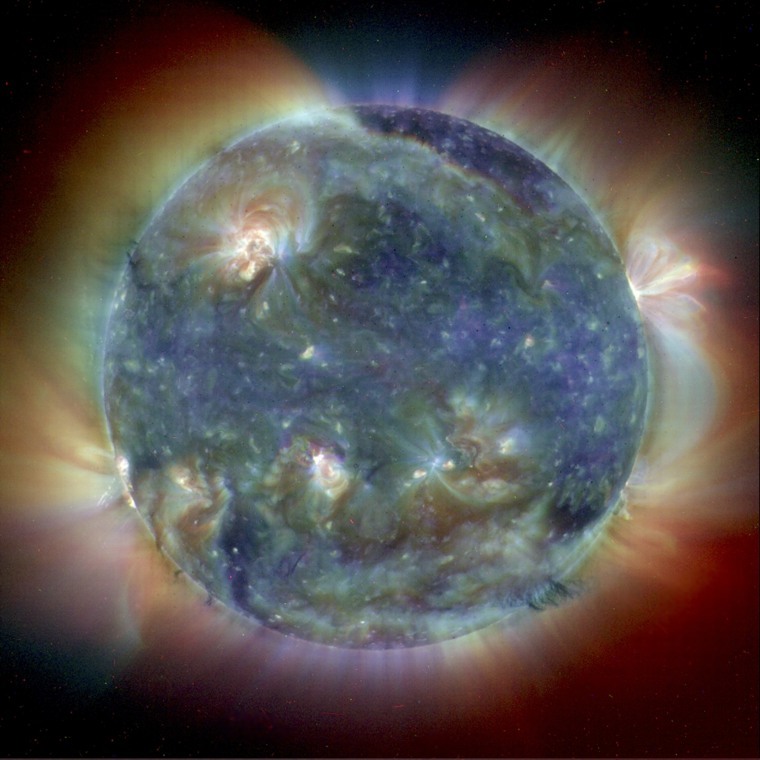 Each wavelength has been color-coded to highlight the different temperatures of gas in the Sun. 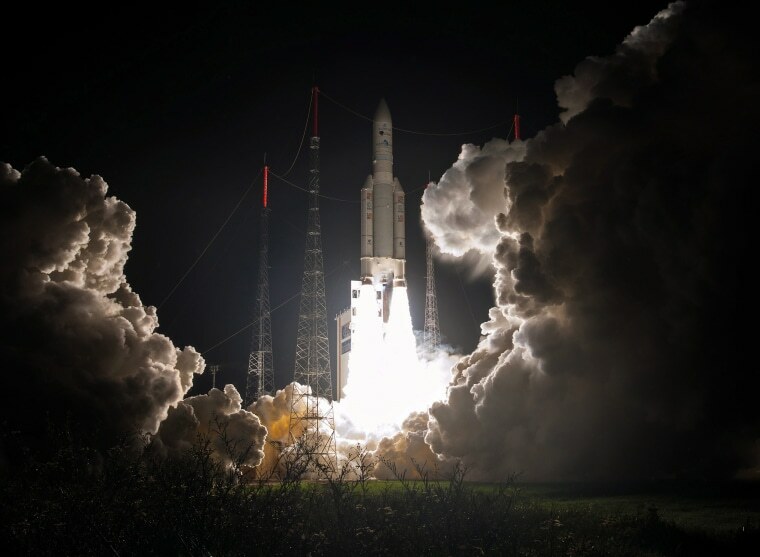 An Ariane 5 rocket lifts off from its launch pad at the European space port Kourou, French Guiana, on March 8. 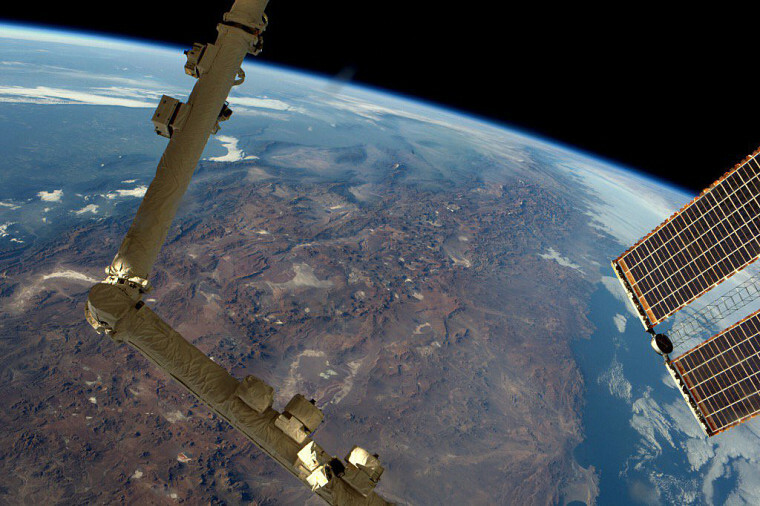 The rocket carried a communications satellite into orbit that will boost the live broadcasting from the 2016 Olympic Games in Brazil. In October of 2013 Hubble kicked off the Frontier Fields program, a three-year series of observations aiming to produce the deepest ever views of the universe. 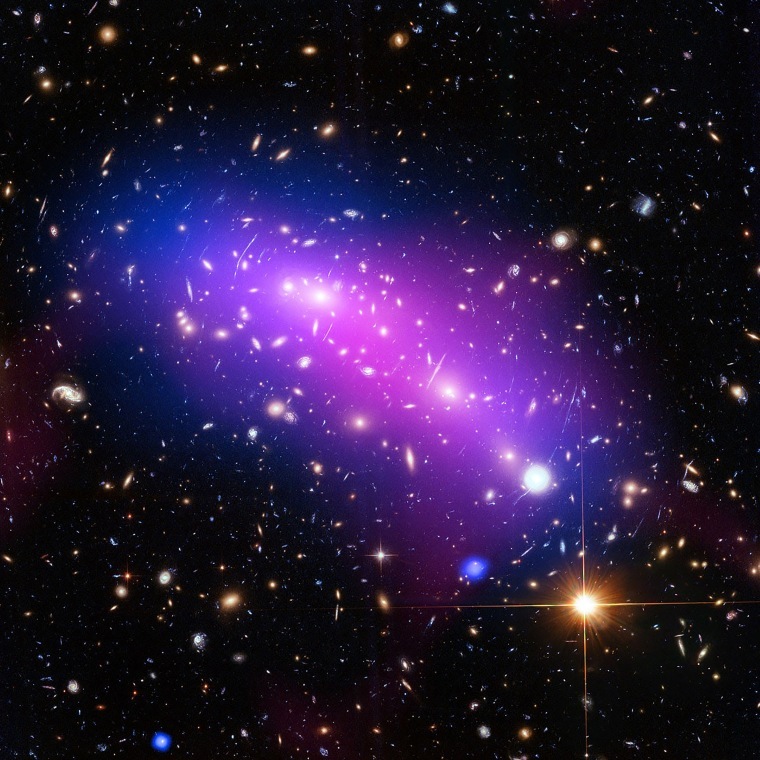 The project's targets comprise six massive galaxy clusters, enormous collections of hundreds or even thousands of galaxies. These structures are the largest gravitationally-bound objects in the cosmos. One of the Frontier Fields targets is shown in this new image, released on March 10: MACS J0717.5+3745, or MACS J0717 for short. MACS J0717 is located about 5.4 billion light-years away from Earth, in the constellation of Auriga (The Charioteer). It is one of the most complex galaxy clusters known; rather than being a single cluster, it is actually the result of four galaxy clusters colliding. This image is a combination of observations from the NASA/ESA Hubble Space Telescope (showing the galaxies and stars), the NASA Chandra X-ray Observatory (diffuse emission in blue), and the NRAO Jansky Very Large Array (diffuse emission in pink). 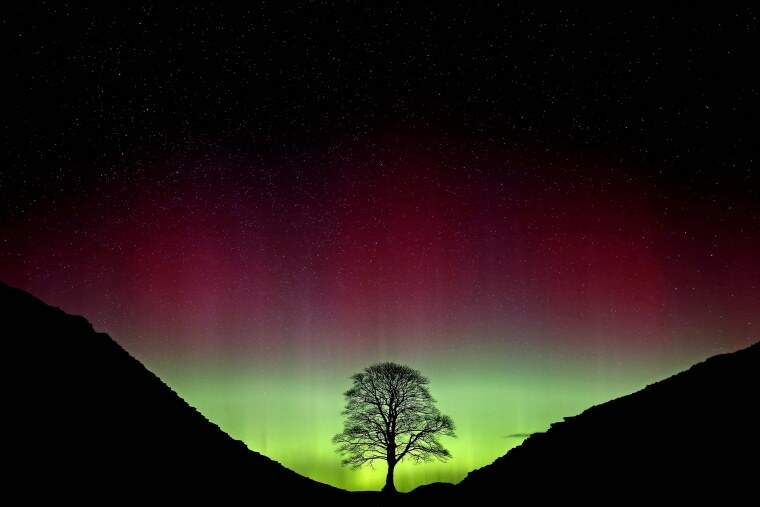 The northern lights, or Aurora Borealis, shine over the Sycamore Gap at Hadrian's Wall in Northumberland, northeast England early on March 7. The northern lights are sparked by collisions between atoms and ions in Earth's atmosphere and electrically charged particles released by the sun. 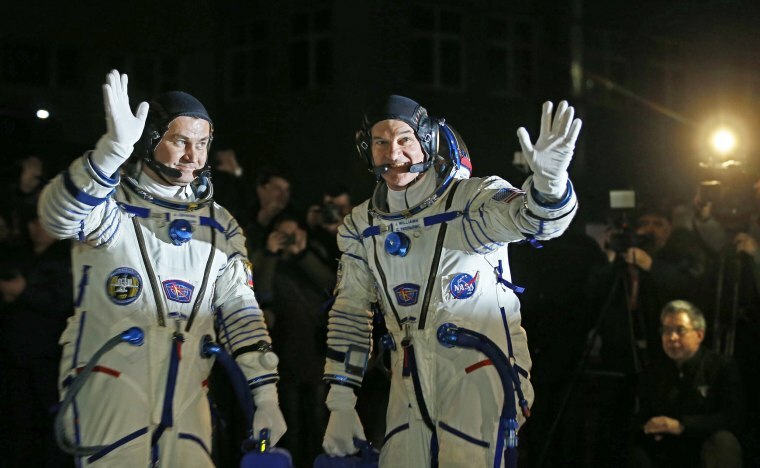 U.S. astronaut Jeffrey Williams, right, and Russian cosmonaut Alexei Ovchinin attend a sending-off ceremony at the Baikonur cosmodrome in Kazakhstan, on March 19, before blasting off to the International Space Station. 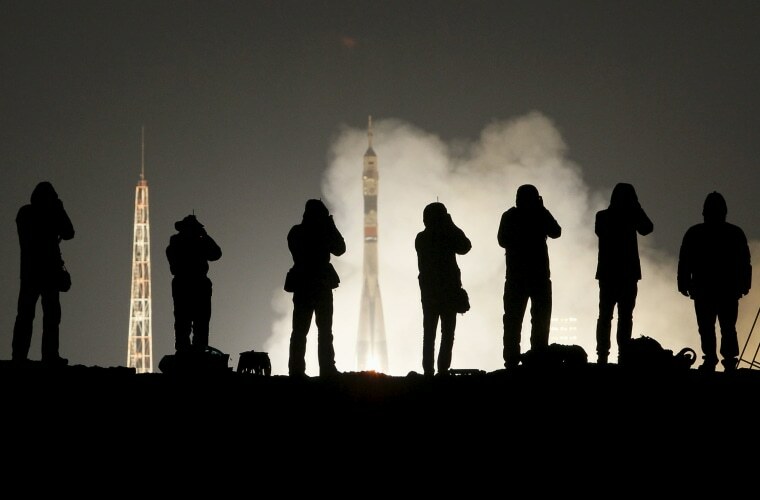 Photographers stand in a line as the Soyuz TMA-20M spacecraft carrying the crew of Jeff Williams of the U.S., Alexey Ovchinin and Oleg Skripochka of Russia blasts off to the International Space Station from the launchpad at the Baikonur cosmodrome in Kazakhstan on March 19. 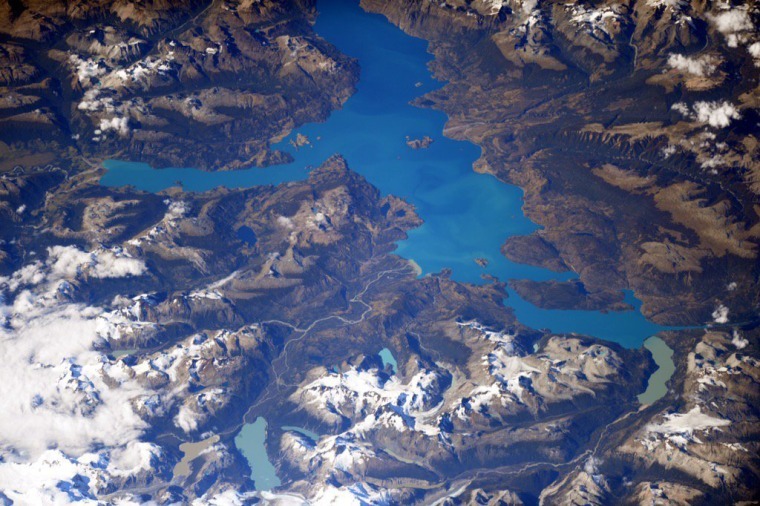 U.S. astronaut Jeff Williams tweeted this view of glaciers and lakes in Patagonia on March 20, saying "The AMAZING view up here is one big reason it's so great to be back." 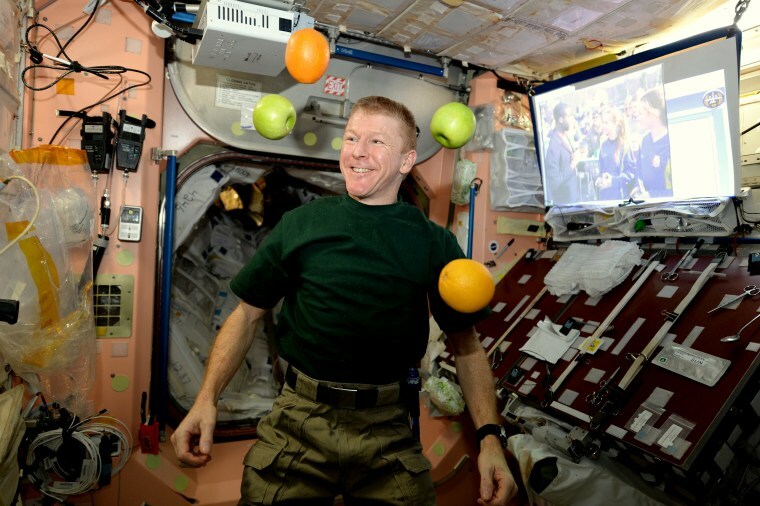 European Space Agency astronaut Tim Peake plays with an arrival of fresh fruit on the International Space Station in an image released on March 24. Tim commented, "Thanks Soyuz 46S crew for the fresh fruit! Nothing quite like a juicy apple!" Tim's six-month mission to the ISS is named Principia, after Isaac Newton's ground-breaking Naturalis Principia Mathematica, which describes the principal laws of motion and gravity. 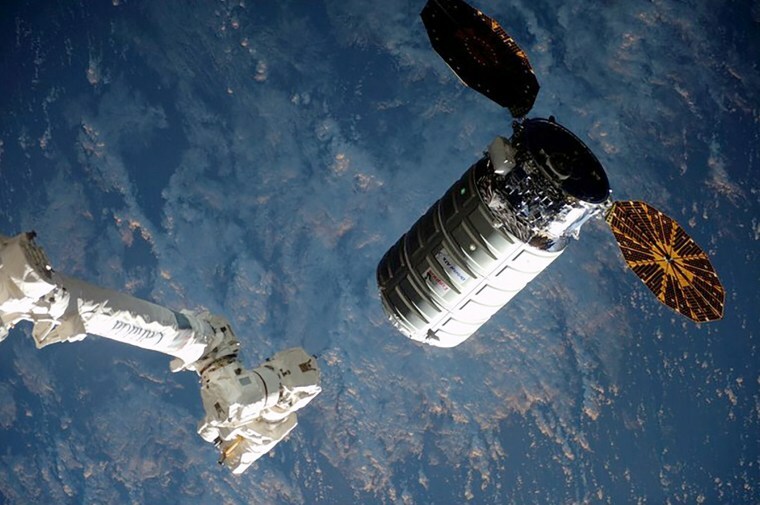 The Cygnus cargo ship nears the robotic arm at the International Space Station on March 26. The capsule was loaded with nearly 7,500 pounds of food, science experiments and equipment including a 3-D printer to build tools for astronauts and non-stick grippers modeled after gecko feet. 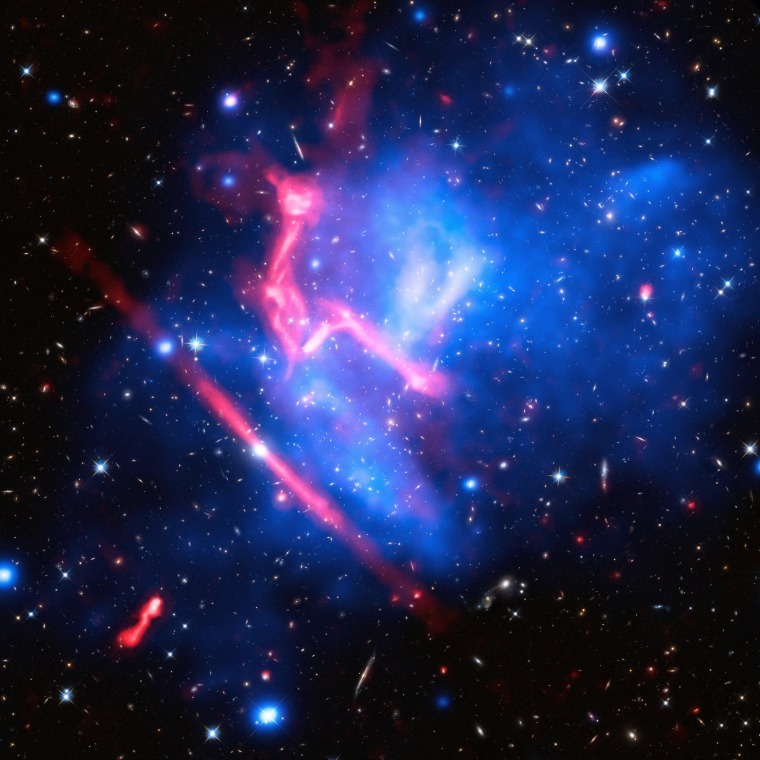 A multi-colored haze marks the site of two colliding galaxy clusters, forming a single object known as MACS J0416.1-2403, in a NASA image released on March 10. The image combines data from three different telescopes: the NASA/ESA Hubble Space Telescope (showing the galaxies and stars), the NASA Chandra X-ray Observatory (diffuse emission in blue), and the NRAO Jansky Very Large Array (diffuse emission in pink). MACS J0416 is located about 4.3 billion light-years from Earth, in the constellation of Eridanus. 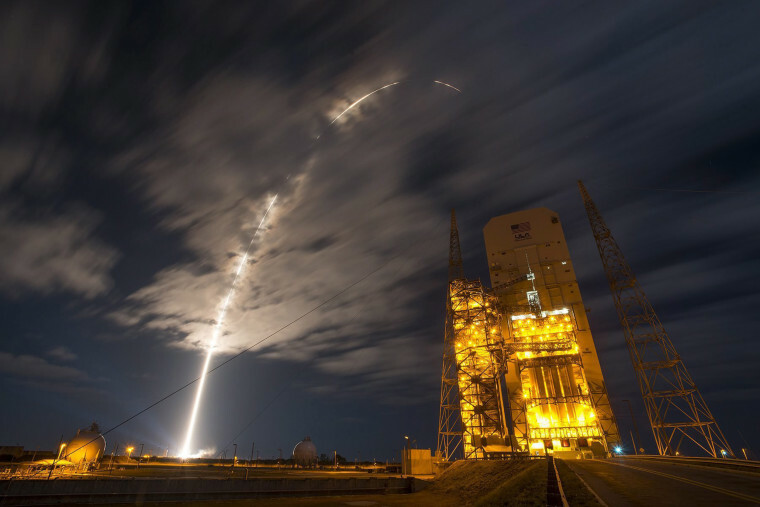 The United Launch Alliance Atlas V rocket carrying Orbital ATK's Cygnus spacecraft on a resupply mission to the International Space Station lifts off from Cape Canaveral in Florida on March 26. U.S. astronaut Jeff Williams tweeted this view of the Andes, looking south, from the International Space Station on March 28. "My best view of this yet!" he said. Haze layers above Pluto were captured by the camera on NASA's New Horizons spacecraft in this image released on March 18. About 20 haze layers are seen; the layers have been found to typically extend horizontally over hundreds of kilometers, but are not strictly parallel to the surface. For example, scientists note a haze layer about 3 miles (5 kilometers) above the surface (lower left area of the image), which descends to the surface at the right. Traveling at more than 30,000 mph and coming within 7,750 miles of the dwarf planet's mottled surface, the New Horizons spacecraft made a historic flyby of Pluto last summer, generating a wealth of science data. The central region of the Tarantula Nebula in the Large Magellanic Cloud is seen in a NASA/ESA Hubble Space Telescope image released on March 17. 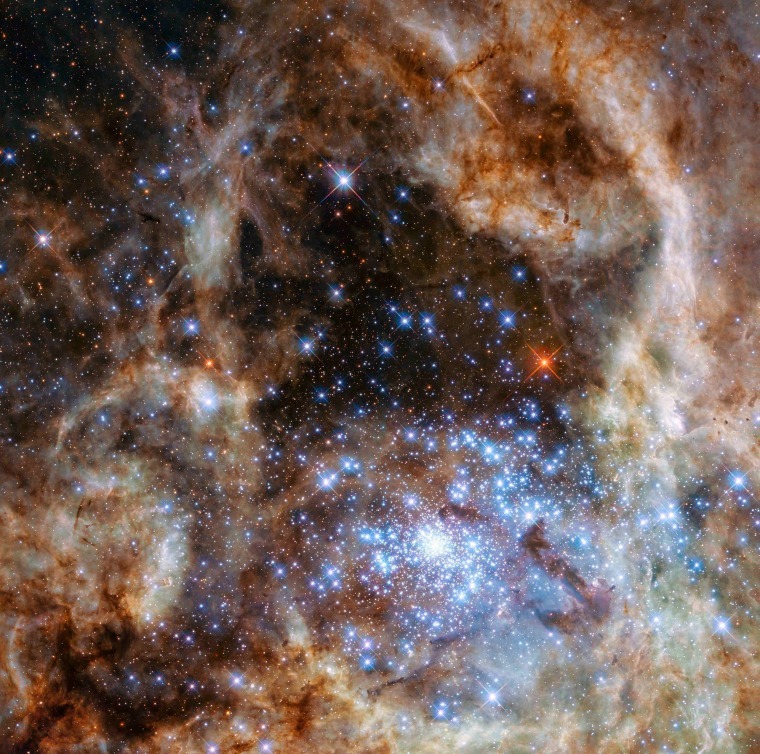 This cluster contains hundreds of young blue stars, among them the most massive star detected in the universe so far, according to a NASA news release. 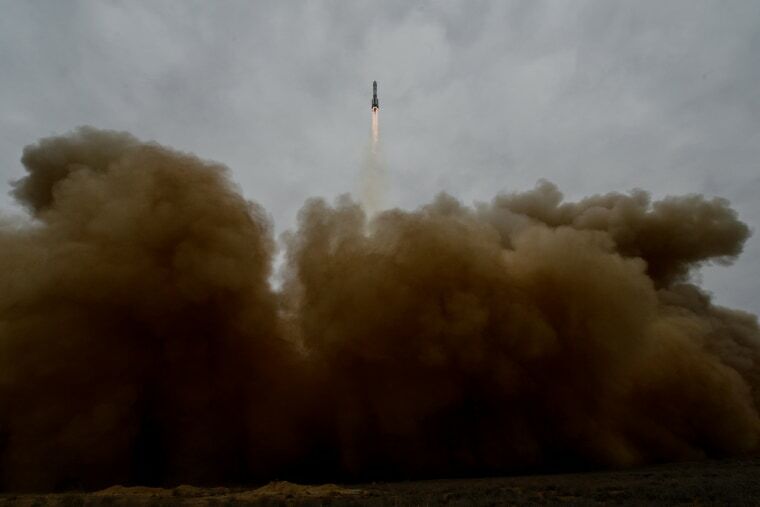 A Russian Proton-M rocket carrying the ExoMars 2016 spacecraft blasts off from the launch pad at the Russian-leased Baikonur cosmodrome on March 14. Two robotic spacecraft began a seven-month journey to the red planet, blasting off together atop the Russian rocket. The spacecraft — the Trace Gas Orbiter and a lander called Schiaparelli — constitute the first part of the two-phase ExoMars program, a European-Russian project to hunt for signs of life on the red planet. The moon passes in front of the sun during a total solar eclipse in Banda Aceh, Indonesia, on March 9. 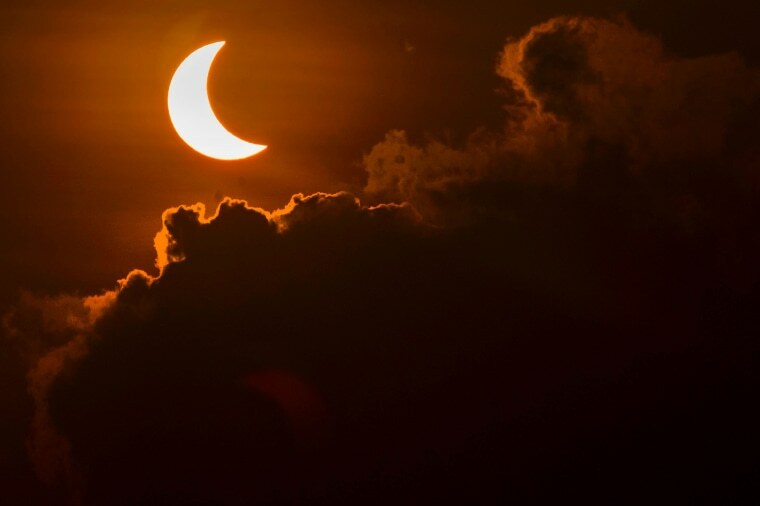 A total solar eclipse swept across the vast Indonesian archipelago, witnessed by tens of thousands of sky gazers and marked by parties, Muslim prayers and tribal rituals.